The actor and former politician fathered a love child with his family’s housekeeper Mildred Patricia Baena, 50, while she was employed by him and it has now been revealed his wife Maria Shriver had their youngest son Christopher, 13, five days before, according to TMZ.com. According to Mildred’s son’s birth certificate, the teen – who has been described by friends as “the type of kid you just want to be around. He is so sweet, funny, and handsome” - was born on October 2, 1997, while Christopher’s birthday is September 27. While Mildred’s ex-husband Rogelio Baena, has been listed as the father on documents, divorce papers filed in February 2008 state the couple have “no minor children”. 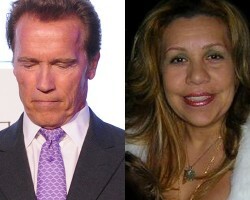 Mildred now lives with a new partner, her son with Arnold, 63, and three other children in a four-bedroom £150,000 house in Bakersfield, outside of Los Angeles, which neighbours claim the ‘Terminator’ star bought for her as a “retirement gift” when she stopped working for him in January. Meanwhile, Arnold’s estranged wife Maria Shriver, 55, who left him when she found out about his love child is said to be considering divorce after she hired prominent Los Angeles attorney Laura Wasser. A source said: “Maria hasn't decided yet if she wants to end her marriage."